SOUTH HOLLAND, IL– Lots of exciting things took place at South Suburban College for Student Appreciation Week, including a contest to name our school mascot, the bulldog. Free t-shirt were given out, and Legacy Barber College provided free haircuts while TRENZ Beauty School offered free manicures. 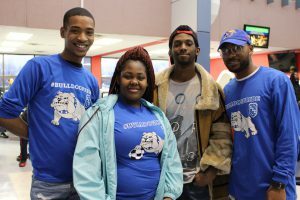 “Jus Words” (followed by students and staff) took the stage during the Poetry Slam, the men’s and women’s basketball teams were spotlighted during a Pep Rally, and the winning name of Bruno for the Bulldog Naming Contest was revealed! The SSC Men’s Basketball defeated Waubonsee Community College 59-51 to advance to the NJCAA Region IV Championship Game on Saturday, March 10, 2017. They will play #1 seeded Morton College at 7:30 pm. The game will be streamed live at www.gochiefs.com/regionIV. The Bulldogs are currently 27-5 on the season and are the #2 seed in the tournament. It is the 11th time in 12 seasons that Coach John Pigatti’s Bulldogs have advanced to the Region IV Championship Game. Congratulations Bulldogs!